Jo Robinson is an investigative journalist focused on health and nutrition - which is reflected in her excellent writing. The farmer directory on her website - Eatwild.com - is the most popular place to find farmers selling grass fed and organic products on the web - you may already have come across it on my Cattle Links page. The prototype to this book, written for the health-conscious beef consumer and called Why Grass Fed Is Best, was a favorite on my bookshelf. This newer, expanded version, called Pasture Perfect, is even better. From the Publisher: This updated and expanded sequel to Jo Robinson’s enormously popular Why Grassfed Is Best explains the myriad benefits of eating meat, eggs and dairy products from grass-fed animals. 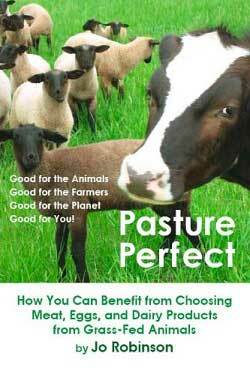 Have you read Pasture Perfect? Share your review in the Comments section below!